The OxyLED T-02U is the upgraded version of T-02 and T02S motion sensor light. Using both PIR technology and night sensor to detect body heat and human motion (within 3m), the OxyLED T-02U Wireless Motion Sensor Light turns on or off based on occupancy and ambient light levels(Auto Mode). In addition, it can light up all the time(Constant on Mode). It is designed to substitute a standard light switch and built for convenience and personal safety in dark areas. Built with rechargeable 700mAh battery, it can be recharged via Micro USB port. It is ideal for corridors, cabinets, workshops, basements, indoor garages, stairwells, doorways, closets, and other dark places in your home and shed. OxyLED T-02U Night Light won't light up during day time when it is bright enough. 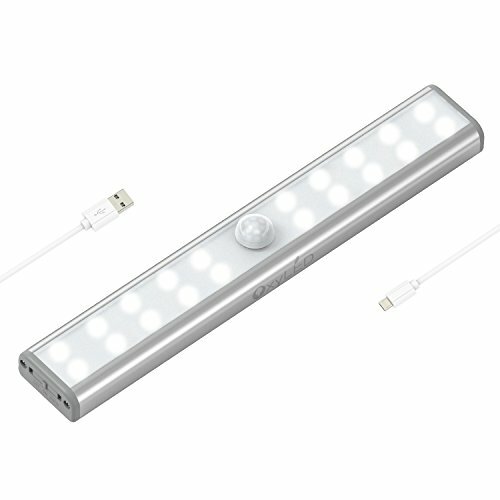 - Because this LED light turns on based on light ambient levels, if another light source is within a close distance, the light may not activate. This allows the light to be energy saving.